Draft: 2002, Florida Marlins, 2nd rd. January 4, 2018 2B Robert Andino assigned to Cangrejeros de Santurce. December 26, 2017 2B Robert Andino assigned to Tigres del Licey. 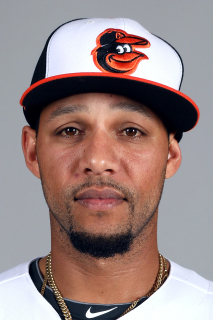 December 4, 2017 2B Robert Andino assigned to Estrellas Orientales. November 6, 2017 2B Robert Andino elected free agency. September 20, 2017 Norfolk Tides activated 2B Robert Andino from the temporarily inactive list. June 25, 2017 Norfolk Tides placed 2B Robert Andino on the temporarily inactive list. May 31, 2017 Norfolk Tides placed 2B Robert Andino on the restricted list. February 7, 2017 Baltimore Orioles invited non-roster 2B Robert Andino to spring training. February 7, 2017 2B Robert Andino assigned to Norfolk Tides. November 15, 2016 2B Robert Andino assigned to Cangrejeros de Santurce. September 20, 2016 Miami Marlins released 2B Robert Andino. September 15, 2016 Miami Marlins designated 2B Robert Andino for assignment. August 14, 2016 Miami Marlins selected the contract of 2B Robert Andino from New Orleans Zephyrs. December 29, 2015 2B Robert Andino assigned to New Orleans Zephyrs. December 14, 2015 Miami Marlins signed free agent 2B Robert Andino to a minor league contract and invited him to spring training. January 30, 2015 2B Robert Andino assigned to Puerto Rico. December 30, 2014 Cangrejeros de Santurce activated 2B Robert Andino. December 30, 2014 Cangrejeros de Santurce placed 2B Robert Andino on the reserve list. October 30, 2014 2B Robert Andino assigned to Cangrejeros de Santurce. October 30, 2014 Cangrejeros de Santurce placed 2B Robert Andino on the reserve list. May 1, 2014 Indianapolis Indians activated SS Robert Andino from the 7-day disabled list. April 5, 2014 Indianapolis Indians placed 2B Robert Andino on the 7-day disabled list. April 2, 2014 2B Robert Andino assigned to Indianapolis Indians. January 7, 2014 Pittsburgh Pirates signed free agent 2B Robert Andino to a minor league contract and invited him to spring training. October 31, 2013 2B Robert Andino assigned to Cangrejeros de Santurce. October 1, 2013 2B Robert Andino elected free agency. August 3, 2013 2B Robert Andino assigned to Indianapolis Indians. August 1, 2013 Seattle Mariners traded 2B Robert Andino to Pittsburgh Pirates. May 27, 2013 Seattle Mariners sent 2B Robert Andino outright to Tacoma Rainiers. May 24, 2013 Seattle Mariners designated Robert Andino for assignment. November 20, 2012 Baltimore Orioles traded 2B Robert Andino to Seattle Mariners for LF Trayvon Robinson. July 31, 2012 Robert Andino roster status changed by Baltimore Orioles. July 29, 2012 sent 2B Robert Andino on a rehab assignment to Norfolk Tides. July 17, 2012 Baltimore Orioles placed 2B Robert Andino on the 15-day disabled list retroactive to July 16, 2012. Left shoulder subluxation. April 27, 2012 Baltimore Orioles activated 2B Robert Andino from the paternity list. October 26, 2010 SS Robert Andino assigned to Leones de Ponce. September 1, 2010 Baltimore Orioles selected the contract of Robert Andino from Norfolk Tides. April 7, 2010 Baltimore Orioles sent Robert Andino outright to Norfolk Tides. April 3, 2010 Baltimore Orioles designated SS Robert Andino for assignment.